Singapore’s smog reveals one thing: the elite is not impervious to scrutiny anymore. The haze sweeping Asia is a hazard to your health — and for members of Singapore’s ruling elite such as the mercurial K. Shanmugam, a threat to your tight grip on power, too. When you are Singapore’s Lee family, and your clan has exercised absolute and uninterrupted control over its swanky specklet of Asia for 54 years, fellows like Kasiviswanathan Shanmugam are handy to have within your power court. K. Shanmugam, as he’s less tongue-twistingly known, may have escaped the attention of those unfamiliar with the cosy connections that hold Singapore’s power elite together — a warm, clubby embrace that has kept them very wealthy. But 54-year-old Shanmugam is a bigwig on the tiny island, which is currently being suffocated by pollution from the periodic burning of millions of hectares of palm oil plantations that have trashed the equatorial habitat of neighbouring Indonesia. That pollution from the illegal fire-clearing of these plantations has swept on eastward winds from Sumatra in massive clouds of smoke and ash to shroud and choke Singapore, southern Malaysia and large tracts of western Indonesia. Call it blowback. Many of these plantations are owned by people with intimate connections to that same power court in Singapore, who helpfully provide them all manner of metropolitan usefulness, banking their billions and domiciling their empires while discreetly looking past, er, indiscretions that may have been perpetrated elsewhere. Many of these plantations are owned by people with intimate connections to that same power court in Singapore, who helpfully provide them all manner of metropolitan usefulness, banking their billions and domiciling their empires. Singapore has 101,000 millionaires officially resident on the island, their assets tucked safely away in the nation’s banks, property and share markets. Plenty of these plutocrats are normal Singaporeans who’ve done well in business. But many are not, like corrupt Indonesians on the run, or Burmese generals seeking safe haven. Singapore’s plutocratic ranks have been swelled in recent years by Europeans and Russians seeking relief from tax and the prying regulators of home, these exiles spending just enough time and money in Singapore to qualify for residency. This, to many, is the useful point of Singapore, where Shanmugam – born in 1959, the very year Lee family patriarch Lee Kuan Yew began his three decades as ruler – has been an MP since 1988 for the Lees’ ruling People’s Action Party (PAP). Shanmugam’s story, and there are many like it in Singapore’s political circles, neatly illustrates how power flows in Singapore, via an apparatus ironically made more visible by the haze crisis. There have been five parliamentary elections since then in Singapore’s almost-democracy, three of them relatively leisurely affairs for Shanmugam; he and his PAP friends were untroubled by any other candidates in their constituency, Sembawang, an area perhaps best known for its US naval facility. But Shanmugam’s selfless devotion to public service – Singapore MPs receive a basic annual allowance of around US$200,000 – hasn’t hindered an even more lucrative career, in law and business. He’s one of Singapore’s most formidable litigators, a leader of the army of Lee-loyalist lawyers who’ve helped win their legal system a contentious reputation as a jurisdiction, most notably in defamation. Singapore is one of the world’s libel capitals, and its litigants – many have been colleagues of Shanmugam, leaders of the ruling PAP – have won record-setting damagesfor defamation by their political rivals and the international media. What would pass as the normal buffeting of election debate in most genuinely pluralist democracies has been, in Singapore, a device of oppression. Here, sensitive politicians and officials, famously led by the Lees themselves, have shown an enthusiastic inclination to sue opponents into penurious legal submission. Singaporean officials, it’s often said, can imagine libel and slander in a harsh glare. All of which helps explain why MPs like Shanmugam don’t always encounter combatants when they run for election. Indeed, this absence of opposition has meant that there’s only been three parliamentary elections in Singapore in the five since 1988 in which the PAP wasn’t returned to office on nomination day – the actual poll being largely irrelevant as to decide who runs the country. K. Shanmugam meeting with Indonesian Foreign Minister Marty Natalegawa last year. Singapore’s respiratory crisis has shone a spotlight on some local companies with interests in the controversial Indonesian palm-oil sector. Shanmugam doesn’t mind highlighting such powerful connections in his sparkling official CV, now for the Nee Soon electorate in Singapore. This biography describes a storied student who became a ‘star litigator’ for Singapore’s biggest law firm, a lawyer who has represented prime ministers past and present. And, busy man, Shanmugam has also served on some illustrious boards while being MP and lawyer-at-large, his biography reveals. For example, he’s held a long and lucrative directorship at one of Singapore’s state-controlled blue chips, Sembcorp (a post he shared with strongman Lee Kuan Yew’s daughter-in-law Lee Suet Fern, whose husband ran Singapore Telecommunications for 12 years), and another on Singapore’s state media regulator, among other establishment posts. Now Shanmugam has been Singapore’s Foreign Minister since 2011, and Minister for Law since 2008, his official salary now somewhere north of $US1 million. He’s the senior official entrusted by his Prime Minister, Lee Kuan Yew’s son Lee Hsien Loong, to go after the polluters they believe are responsible for the life-threatening haze, now too thick to ignore, which has engulfed their region. “If any Singapore companies are involved,” thundered PM Lee last week, “or companies which are present in Singapore are involved, we will take it up with them." Indeed, Jakarta has helpfully identified as many as 14 companies it believes responsible for the muck, while reminding Singapore that many more Indonesians are suffering its effects than inhabitants of the look-at-me island nation. Two of the companies fingered by Indonesia are its Widjaja family’s Sinar Mas Agro Resources and Technology (SMART), which has long been a target of environmentalists,and Asia Pacific Resources International (APRIL), controlled by the Indonesian-born Singaporean tycoon Sukanto Tanoto. 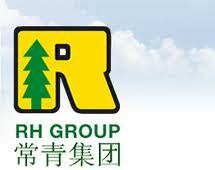 Both are based in Singapore, where SMART’s parent company is the locally listed Golden Agri-Resources. And this is where Lee’s Foreign and Law Minister K. Shanmugam comes in again. Two of the directorships that don’t appear in Shanmugam’s glittering CV are his formerstints as a director of Golden Agri-Resources and Asia Food and Property Ltd.
APP’s debts were effectively written off and, like so many dodgy Indonesians and Singaporeans of that era, the Widjajas regrouped to do business another day – to pollute again. Both are Singaporean companies controlled by Indonesia’s controversial Widjaja family. In the early 2000s, while Shanmugam was on these boards, the Widjajas had the dubious honour of owning the notorious Asia Pulp and Paper, which would come to be responsible for the biggest bond default in corporate Asian history. What transpired at APP was a US$13 billion fiasco, a scandal largely unearthed by the pesky foreign media, and which exposed Singapore as something other than the squeaky-clean financial centre its government likes to internationally promote itself as. Transferring public company funds through a murky family-controlled bank in the tax haven of the Cook Islands was a sleight of hand much favoured by the Widjajas. No-one involved with the APP scandal was ever prosecuted or brought to legal book anywhere. Those foolish enough to have invested with the Widjajas absorbed huge hits. Most of APP’s debts were effectively written off and, like so many dodgy Indonesians and Singaporeans of that era, the Widjajas regrouped to do business another day – topollute again. As for Shanmugam, after firing off a few threatening legal salvos at the time to anyone who too publicly mentioned his connection to the Widjajas, he later resigned his directorships and resumed his legal and political career. The Global Mail isn’t suggesting that Shanmugam was in any way party to the financial scandal that then engulfed the Widjaja empire. Indeed, all reports at the time suggested he was embarrassed by his links to the Widjajas. Nor are we saying that he is involved in the haze outrage that now engulfs them. And, despite being identified by Jakarta as a polluter, Golden Agri insists “there are no hotspots or fires” at its Sumatran plantations. Should this assertion of innocence be proved wrong, Shanmugam, now as a minister, would at least know who to call when asked to bring miscreants to book; that is, if he doesn’t first recuse himself from official involvement given his one-time close links to the controversial Widjajas. But that doesn’t seem likely. Last weekend, Shanmugam reportedly joined his PM and other government colleagues in handing out some of the million-odd facemasksSingapore has bought to distribute to low-income Singaporeans affected by the haze. Face masks sold out in Singapore’s stores, and the government handed out more — along with advice to wear them even indoors. TGM emailed Mr Shanmugam a series of questions about his former links to the Widjaja’s Golden Agri but did not receive a response. Singapore’s respiratory crisis has also shone a spotlight on some other local companies with interests in the controversial palm oil sector. One of them is particularly close to PM Lee, at the core Singapore’s politics-meets-business power apparatus: Temasek Holdings, Singapore’s influential state-owned investment company, which controls companies such as Singapore Telecom, Singapore Airlines and Australia’s Optus, also holds big stakes in myriad international businesses. One of those investments is in CTP Holdings, Temasek’s Singapore-based joint venture with the US agricultural group Cargill. CTP operates oil-palm plantations in Indonesia. Last week, CTP was quick to say its holdings are well away from the current hotspots that have so polluted the Singapore environs. In any event, CTP’s backers claim their plantations operate a strict no-burn policy, and Temasek and Cargill have been keen to distance CTP and themselves from any environmental outrage. Which is not how the US environmental lobby Rain Forest Network sees CTP’s operations in Indonesia’s Kalimantan region, to Singapore’s east; the group accuses CTP of clearing rainforest without permits, destroying watersheds and burning forests. That Temasek was moved to publish a press release on the palm oil crisis at this time is itself instructive. It speaks to the rising opposition to Singapore’s Lee-led establishment, which revealed itself most eloquently in the last parliamentary and presidential elections, in 2011, in which the opposition not only fielded a record complement of candidates but made genuine gains against the PAP-dominated system. Amidst the tumult from Tahrir Square and the tragedy of Syria, this ‘Singapore Spring’ hasn’t registered internationally with quite the impact of the Arab prototype that inspired it. But to the 5.3 million Singaporeans now coughing through yet another haze outrage blown in from Indonesia, their spring has arrived in the increasing accountability they demand of Singapore’s once impervious courtiers in running national affairs. In a town where ‘normal’ political activity is deemed off limits, Temasek’s management has been a proxy political tool the opposition can fulminate about – Temasek as the symbolic vehicle of PAP patronage and performance. Amidst the tumult from Tahrir Square and the tragedy of Syria, this ‘Singapore Spring’ hasn’t registered internationally with quite the impact of the Arab prototype that inspired it. Temasek and its likewise state-owned sister fund, the Singapore Government Investment Corporation, officially invest Singaporeans’ money. Like the more transparent sovereign wealth funds of democratic Norway and East Timor, and those more opaque in the Gulf monarchies, these two companies are national nest eggs owned by all Singaporeans, and in which every Singaporean notionally has a say. Temasek, which by some measures has an interest in as much as 60 per cent of the Singaporean economy, has been run by PM Lee’s wife, Ho Ching, since 2003. And her patchy investment record would likely have seen her removed, had she performed similarly in any Western company. That record has increasingly been the subject of rational analysis, by academics and aspiring Singaporean politicians such as Kenneth Jeyaretnam, who would like to see these funds broken up and privatised. Such transparency has been refreshing for Singaporeans, but other things don’t change. It remains out of bounds in Singapore to debate if Madame Ho got – and kept – her job because she’s a member of the Lee family. The last voice to publicly do this was a well-followed local blog, the Temasek Review Emeritus, which was swiftly threatened by one of the Lees’ notorious legal onslaughts en route to being forced into a grovelling apology. Today, it’s a rare Western media outlet – those with corporate interests or circulation in Singapore are particularly reticent – that will examine the Temasek record as they might similarly influential corporations elsewhere, such as Apple, Shell or BHP Billiton. For media reporting on Temasek’s activities, official Singapore has insisted that it be accurate in its facts, and that it refer to Temasek as an “Asian investment company”. For good measure, Temasek would also prefer that any reference to Madame Ho as the PM’s wife be expunged. Singapore’s pliant media does what its told but foreign press is less observant of local sensitivities. But the media, indeed anyone with cause to analyses Temasek, such as credit rating agencies and banks, can’t fulfill the latter requirements without noting the former. Accuracy and investment decisions demand that Temasek be properly identified as being owned by the Singapore government. And there’s no avoiding the fact that Madame Ho, who often very publicly travels with her husband on state tours abroad, is Mrs Lee, a very powerful and wealthy Mrs Lee, if not always a particularly astute investor of her compatriots’ nest egg. For all the putridness that the clouds now defiling Singapore and beyond are depositing, they may yet come with a silver lining, of more transparency for one Asia’s most rigid societies. Kami pihak UMB PBB dan BN Sarawak menyokong dan memperakui kenyataan Ketua UMB UMNO merangkap Ketua UMB Barisan Nasional Kebangsaan Saudara Tun Faisal bertarikh 15 Jun. Ketua UMB Sarawak BUKAN pihak yang diberi keupayaan cukup untuk mengendalikan perang siber di Sarawak pada Pilihanraya Parlimen Mei lepas. Kenapa terdapat arahan serangan kononnya dari pegawai pejabat pemimpin tertinggi tertentu untuk mempertikaikan UMB sedangkan bukan UMB yang mengendalikan operasi ini secara tunggal dan sepenuhnya sejak PRN 2011? UMB sering dijadikan scapegoat oleh pihak tertentu untuk menafikan kegagalan mereka. 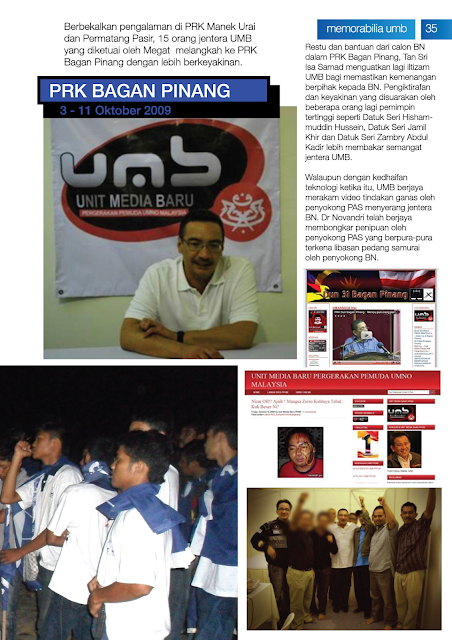 Misalnya, bila kumpulan blogger tertentu gagal di dalam sesuatu misi, untuk mengelakkan diri dari dipertanggung jawabkan, mereka akan terus menyalahkan UMB sebagai jentera parti. UMB PBB Sarawak adalah PIONEER dalam cyberspace di Sarawak sejak tahun 2010. Namun perkara ini tidak di ketahui ramai. UMB PBB Sarawak mengendalikan latihan siber PERTAMA di bumi kenyalang bersama JASA di Universiti Swinburne pada tahun 2010. 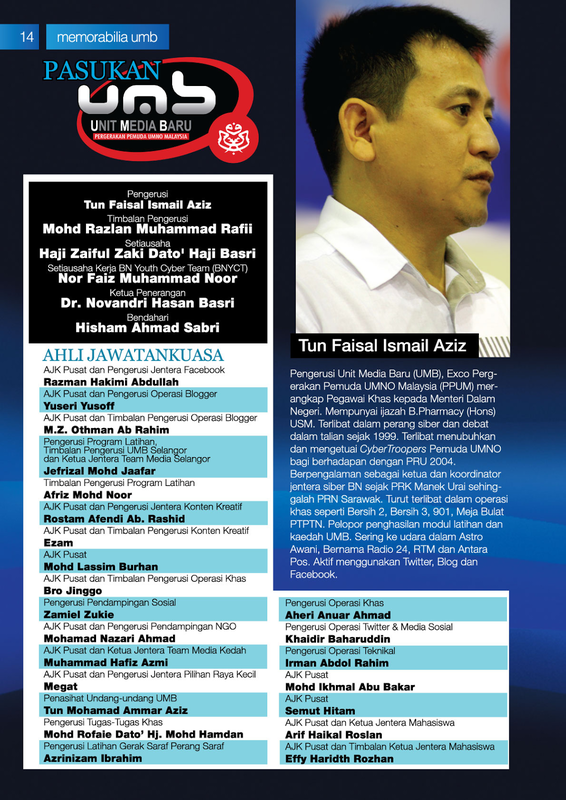 UMB PBB Sarawak dan rakan-rakan UMB SPDP dan PRS telah bekerjasama erat dengan Tun Faisal serta UMB UMNO pada Pilihanraya Negri Sarawak 2011. Jutaan terima kasih dan penghargaan kami ucapkan kepada Tun Faisal serta UMB UMNO kerana telah sudi meluangkan masa dan keringat untuk berjunag bersama pada Pilihanraya Negri Sarawak 2011. Selepas Pilihanraya Negri Sarawak 2011 terdapat ketua setiausaha 'baru' di pejabat Ketua Menteri Sarawak. Pihak baru ini tidak adapun (mentah siber) dari 2010 sehingga PRN Sarawak 2011. Untuk 24 bulan dari PRN 2011 sehingga PRU 13 UMB BN Sarawak tidak mendapat sokongan dana walau SATU SEN PUN. Walaupun sungguh banyak permohonan dan tunjuk kerja telah diPERSEMBAHKAN kepada pemimimpin yang dipertanggunjawabkan untuk menolong namun SATU SEN PUN tidak mendapat sokongan. Dalam 24 bulan ini ketua setiausaha 'baru' di pejabat ketua menteri telah menyebarkan FITNAH bahawa UMB PBB SONGLAP duit. Masalahnya macam mana nak songlap duit kalau duit tak ada. Bak kata Tun Faisal "BANYAK CANTIK!". Ini bukan tak 'gentleman' lagi tetapi 'malicious' dan 'slanderous'. Namun begitu untuk beberapa bulan Ketua UMB Sarawak menghulurkan DUIT SENDIRI untuk mengapungkan UMB PBB dan BN Sarawak. 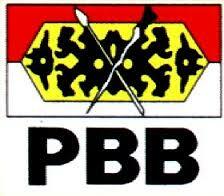 Daripada memfitnahkan UMB PBB Sarawak, "I would rather say thank you and be on your way...". Pengarah sebenar Operasi Siber BN PRU13 adalah seorang khunsa? Memorabilia UMB - merekodkan perjalanan UMB dari permulaan sehingga tahun 2012. 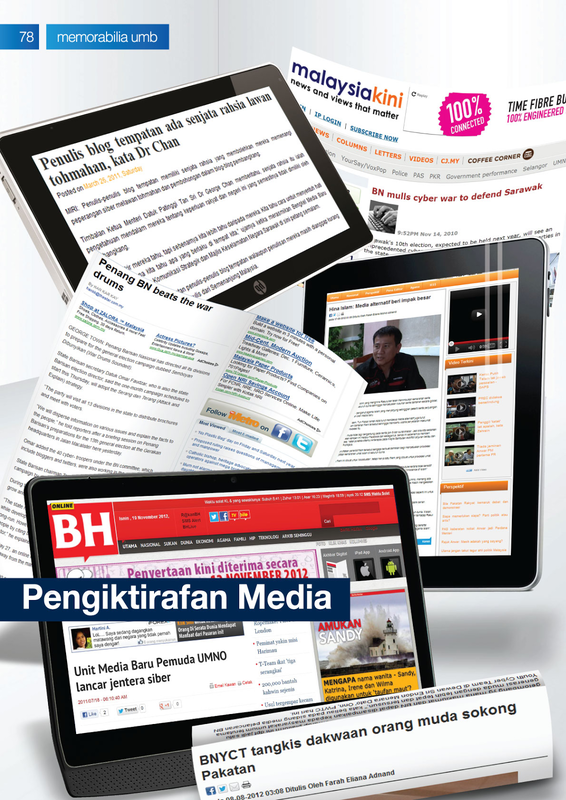 Seperti yang dijanjikan, ini adalah siri kedua penerangan untuk mengelakkan salah tanggap masyarakat terhadap Unit Media Baru (UMB) Pergerakan Pemuda UMNO. 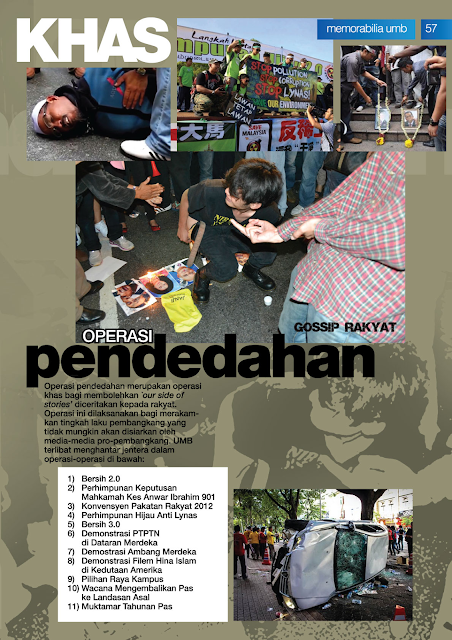 Siapa sebenarnya KETUA PEGARAH / KETUA PENGARAH OPERASI / COO operasi siber Barisan Nasional (BN) PRU13? Adakah Datuk Ahmad Maslan, Ketua Penerangan UMNO? Adakah Menteri Penerangan atau Menteri Propaganda Datuk Seri Utama Rais Yatim? Setiausaha Agong UMNO, Datuk Seri Tengku Adnan Tengku Mansor? Datuk-Datuk Ahli Majlis Tertinggi? Setiausaha Akhbar Perdana Menteri? Atau adakah dia Presiden Bloghouse? Pengerusi UMB? Salah seorang dari lembaga jemaah pentadbir MyKMU? Pengerusi Nadi Rakyat? Pengerusi Kaukus Blogger-blogger bebas? atau siapa sebenarnya? Yang pastinya bukan Pengerusi UMB. Jadi kenapa terdapat arahan serangan kononnya dari pegawai pejabat pemimpin tertinggi tertentu untuk mempertikaikan UMB sedangkan bukan UMB yang mengendalikan operasi ini secara tunggal dan sepenuhnya? UMB sering dijadikan scapegoat oleh pihak tertentu untuk menafikan kegagalan mereka. Misalnya, bila kumpulan blogger tertentu gagal di dalam sesuatu misi, untuk mengelakkan diri dari dipertanggung jawabkan, mereka akan terus menyalahkan UMB sebagai jentera parti. Mereka akan kata KAMI BUKAN JENTERA PARTI, APA JENTERA PARTI BUAT? Sedangkan arahan dan peruntukan diberikan kepada mereka, bukan kepada jentera parti. Trend yang sama juga berlaku selepas PRU13. Bagi saya, kalau tidak ada pihak yang CUKUP BERANI untuk memikul tanggung jawab kegagalan sesuatu operasi dan jika semuanya hendak dipersalahkan ke atas UMB, TIDAK ADA MASALAH - beri kami penghak upayaan untuk mengetuai keseluruhan operasi. SENANG - kalau nak jentera parti buat, we are not short of talents to do it lah. Hari ini kita tak mahu bercerita tentang siapa yang mengetuai operasi siber PRU13. Cukuplah untuk menyatakan, UMB hanya salah satu kumpulan daripada banyak kumpulan yang membantu operasi BN semasa PRU13. Bagi saya, penyelarasan gerak kerja PRU13 sebenarnya tidak gagal. Tahniah kepada yang terlibat. Ianya jauh lebih baik daripada sebelum ini dan tentunya hasrat kita agar gerak kerja ini terus diperkemaskan lagi bagi menghadapi cabaran PRU14 yang lebih sengit. Bagi pihak yang hanya jadi alat untuk menyerang UMB, biar saya jelaskan serba sedikit track record blogger dan cybertrooper UMB. Antara mereka adalah blogger seperti Dr Novandri, Pisau, Kedah ke KL, Medan Tempur Kedah, Media Permatang Pauh dan ramai lagi. Belum masanya untuk menyenaraikan siapa blogger dan cybertrooper UMB, termasuk yang terlibat di dalam operasi-operasi khas. Mereka juga terlibat merangka modul latihan perang siber, mengendalikan dan membantu mengendalikan sejumlah 32 program latihan, termasuk yang dianjurkan oleh Ketua Penerangan UMNO Malaysia, Datuk Ahmad Maslan dan melatih hampir 2,000 orang jentera siber di dalam UMNO sejak tahun 2009. UMB juga pernah diminta untuk memberi taklimat dan pendedahan mengenai perang siber, khususnya pengalaman Malaysia, kepada sejumlah pemimpin parti-parti politik dari negara-negara tertentu. Selain itu, mereka juga merupakan antara penggerak utama yang membantu kempen dan operasi berikut, Perhimpunan Bersih, Anti-Lynas, Bebas Anwar 901, Pro Aspirasi Mahasiswa, Jelajah Aman Kampus, Meja Bulat PTPTN, Demonstrasi PTPTN, Sambutan UMNO 66, Jelajah Destini Anak Bangsa UiTM, Bee Ant Blues Hari Belia Negara, Demonstrasi #JanjiBersih Ambang Merdeka, Promosi Tweet Merdeka 55 dan 1M4U. Jelasnya mereka ini mempunyai pengikut dan kekuatan tersendiri; dan yang paling penting, mereka bukan bukan menulis, berfacebook atau bertweet hanya dari dalam bilik, sebaliknya mereka orang yang masak dengan pengalaman operasi di lapangan. KUALA LUMPUR, May 26 — The DAP will take its protest against Utusan Malaysia to Parliament when it sits next month, deputy chairman M. Kulasegaran vowed today as he lashed out at the Umno-owned daily for going on a warpath against budget carrier AirAsia. “The paper and Umno can do whatever they want at the end of a long day the ordinary people will support AirAsia, just as the majority of Malaysian voters supported Pakatan Rakyat (PR), though it was Umno-BN that won a disputed election (SELF CONTRADICTION),” he said in a statement here. The call to boycott AirAsia was mooted by Utusan’s Awang Selamat — the nom-de-plume for the paper’s collective editorial voice — in its column on May 19 in retaliation to criticism from Azran Osman over what the latter reportedly saw as racial instigation in the aftermath of the May 5 polls. In response, the paper had published daily views from Perkasa leaders, the Muslim Consumers Society of Malaysia and activists who slammed Azran, branding him “arrogant” and a Malay who had forgotten his roots. Perkasa’s acting president Datuk Abdul Rahman Bakar, who had rallied to the paper’s defence, blasted Azran, saying the latter could not have climbed up to his present position without the “Malay power fought for by Utusan Malaysia”. He said that as the apparent mouthpiece of the country’s ruling party, it would have been reasonable to expect the paper to be chastened by the detailed results of the just-concluded May 5 polls, which saw Barisan Nasional (BN) lose a large chunk of support from the urban middle to upper class voters. Without censuring Utusan Malaysia for its actions, he said it appeared as if Umno’s top brass were condoning the paper’s boycott call. 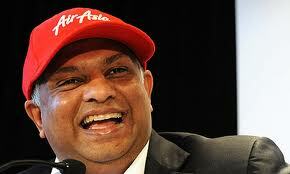 “I urge Azran not to apologise to Utusan,” he said. “I will raise this issue when the 13th Parliament opens its inaugural session which is scheduled to begin June 24. 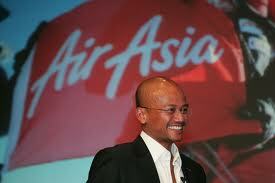 “I urge Malaysians to stand by Azran and to give Air Asia our fullest support,” he added. 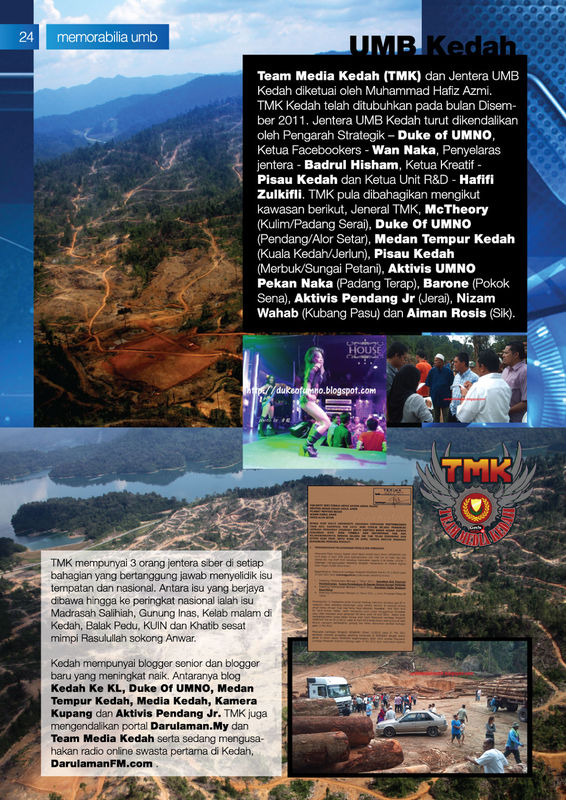 TUMPUAN PELABUR: Taib serta isterinya, Puan Sri Ragad Kurdi Taib memerhatikan poster mengenai pelancaran buku Inside Sarawak 2013 oleh Inside Investor di Kuching, semalam. KUCHING: Sarawak komited untuk memperkukuhkan hubungan ekonomi dengan Timur Tengah dalam usaha menarik lebih ramai pelabur ke negeri ini. Ketua Menteri Pehin Sri Abdul Taib Mahmud berkata, meskipun hubungan dengan Timur Tengah telah terjalin sejak sekian lama, tetapi sekarang tiba masanya untuk memperhebatkannya, memandangkan ramai pelabur dari kawasan berkenaan berminat untuk melabur di Asia Tenggara. “Sejak dua, tiga tahun lepas, kita menerima sokongan serta kerjasama yang baik dengan Inside Investor atas sebab mudah, iaitu kita ada persefahaman tinggi mengenai penekanan kepada usaha untuk menarik pelabur dari Timur Tengah datang ke Asia Tenggara. “Hari ini saya menyatakan sekurang-kurangnya ada sesuatu yang konkrit sedang berkembang antara Sarawak dan Qatar dan kita sudah mengenal pasti bidang mana yang kita mahu jalinkan hu-bungan ekonomi,” katanya. Beliau berkata demikian ketika melancarkan buku Inside Sarawak 2013 yang diterbitkan Inside Investor dan dihadiri Pengarah Urusan Inside Investor Ltd Imran Saadique di sini, semalam. Taib berkata, pelancaran buku itu mampu menjadi pemangkin kepada lebih banyak urus niaga lain antara Sarawak dan Timur Tengah. Kata beliau, Sarawak menawarkan banyak peluang khasnya berikutan pembangunan Koridor Tenaga Diperbaharui Sarawak (SCORE) yang membolehkan banyak pihak mengambil bahagian dalam pengembangan dan pembangunan yang menawarkan pelbagai peluang perniagaan. Tambahan pula, kata beliau, Sarawak mempunyai perancangan berterusan untuk 20 tahun akan datang termasuk mewujudkan tenaga hidro melalui beberapa empangan yang akan meningkatkan kuasa sehingga 20,000 megawatt, manakala 5,000 megawatt dijana daripada sumber arang batu. “Malah ia memerlukan banyak pembiayaan dan berdasarkan pengalaman kami dalam pembangunan Empangan Murum, kami mendapat sambutan baik dari pasaran kewangan,” jelasnya. Sementara itu, Taib berkata Taman Perindustrian Samalaju yang dilancarkan kira-kira dua tahun lalu kini mempunyai hampir 9,000 hektar estet perindustrian dan dilengkapi pelabuhan yang bakal beroperasi menjelang Disember depan. Kata beliau, peringkat pertama pembangunan Samalaju telah membolehkan Sarawak menarik pelaburan bernilai sekurang-kurangnya RM4 bilion. “Namun masih terdapat banyak permohonan untuk menubuhkan industri di kawasan Samalaju pada masa akan datang yang dijangka mampu mencapai lebih daripada RM20 bilion,” katanya. Imran dalam ucapannya berkata, Sarawak merupakan contoh terbaik kepada negeri-negeri di Malaysia serta Asia Tenggara apabila muncul antara negeri yang mencatatkan pertumbuhan ekonomi paling positif. “Sejak 30 tahun lalu, Sarawak membangun dengan baik termasuk dari segi pertumbuhan ekonomi yang membawa manfaat dan peluang perniagaan kepada rakyatnya,” katanya. Dalam pada itu, Sarawak dijangka muncul sebagai antara tiga negeri yang menjadi penyumbang utama Keluaran Dalam Negara Kasar (KDNK) negara dalam tempoh beberapa tahun akan datang. Jangkaan itu menurut buku Inside Sarawak 2013 adalah berdasarkan keupayaan SCORE dalam memacu pertumbuhan KDNK hingga enam peratus pada tahun 2015 berbanding lima peratus pada tahun 2012. “Pada masa sekarang, Sarawak menyumbang kira-kira 9.5 peratus terhadap keseluruhan KDNK sebenar Malaysia. “Sumbangan KDNK Sara-wak pada 2012 cuma berada di kedudukan selepas Selangor, Johor dan Pulau Pinang,” kata buku tersebut dipetik menerusi artikel Sarawak Outlook. Sebagai negeri terbesar dalam Malaysia dan mungkin negeri terkaya, Sarawak kini di landasan betul ketika negara berada di pertengahan Rancangan Malaysia Ke-10 (RMK10) yang mula dilaksanakan pada 2010. Majoriti perbelanjaan kerajaan menerusi RMK10 disalurkan bagi memperbaiki infrastruktur terutama peng-angkutan, pengurusan urbanisasi dan menukar Sarawak sebagai hab industri tenaga. “Dengan SCORE sebagai pemacu pertumbuhan, Sara-wak berupaya mencapai enam peratus KDNK pada 2015,” katanya. Ekonomi Sarawak tumbuh lima peratus pada 2012, antara yang terpantas di kalangan negeri-negeri lain Malaysia, malah di ASEAN. “Perkembangan sihat itu ditunjangi oleh kekukuhan permintaan domestik dijana aktiviti-aktiviti ekonomi daripada pelaksanaan SCORE dan projek-projek RMK10,” ujarnya. Malaysia Airports Holdings Bhd's (MAHB) harshest critic, AirAsia Bhd, played a significant part in both cost overruns and delays in the construction of the new RM4 billion low-cost carrier terminal, KLIA2, according to sources familiar with the matter. 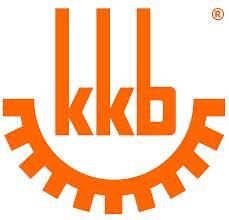 It is noted that MAHB has come under considerable flak as a result of the delay in KLIA2. Managing director Bashir Ahmad Abdul Majid’s (right) contract, which expires on June 7, has yet to be renewed and this results in speculation that he will be taking the fall for the delay. None of the parties involved - MAHB officials or Bashir, UEM Group and partner Bina Puri Holdings Bhd, which won a RM997 million contract for the design, construction, commissioning and maintenance of the main terminal building of KLIA2, a satellite building, sky-bridge and piers and budget airline AirAsia Bhd - came on record for this article. 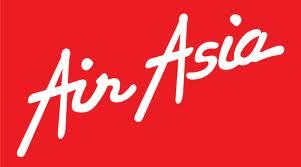 From news reports, AirAsia’s chief executive officer Aireen Omar said that she was “disappointed” with the latest delay. "It’s not going to be comfortable for passengers as the low-cost carrier terminal (LCCT) copes with overcapacity,” Aireen (left) said after AirAsia’s annual general meeting on Tuesday. From this statement, it seems as though AirAsia is distancing itself from MAHB and played no role in the delay, which is not the picture painted by others who had been involved in KLIA2. Another statement by AirAsia that raised eyebrows was when its officials publicly stated that the budget airline will not move into KLIA2 until it is convinced that the new terminal is “100 percent ready”, and will be staying put at the current LCCT till then. “It seems as though AirAsia is in a very powerful position... can dictate terms, can control MAHB, (and is able to) spell out what MAHB can and cannot do,” an industry observer commented. 1. After Parliament was dissolved on the 13th April 2013, I was interviewed by a BBC journalist. He appeared quite convinced that race-based parties such as those in the National Front would be rejected by a more liberal electorate which believes in democracy, freedom and non-racial politics. Also the idealistic young would reject the BN. 2. I had to disagree with him as I believed that racial polarization in Malaysia had become more pronounced now than ever before. I may not always be right but after 60 years involvement in Malaysian politics I felt strongly that the race factor will continue to dominate the politics of the country. The quality of the candidates or parties, the ideologies and the desire for change will always be secondary to race. 3. The election results showed that I was right. The DAP playing on racial sentiments drew the Chinese away from BN by depicting the MCA as lackeys of UMNO. The DAP won 38 seats, reducing the MCA’s seats from 15 to 7. The Gerakan won one seat out of two. All the DAP Chinese contested in Chinese majority constituencies. A few of the MCA, Gerakan and MIC candidates contested in Malay majority constituencies. 4. 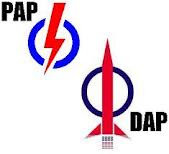 Although the DAP claims to be multiracial, it is in fact a Chinese party with mainly Chinese members and leadership. When it held elections to its Central Committee recently other than Karpal Singh all the members elected were Chinese. 5. Hatred of the Malays was whipped up through the slogan “Malaysian Malaysia”, implying that Malaysia is for the Malays only while other races were discriminated against and alleged to be second class citizens. Advocating meritocracy, the extremists Chinese in the DAP charged the BN Government of discriminating in favour of the Malays even though they were inferior and less qualified for places in the universities, awards of scholarships, contracts, licences and positions in the Government. The Malay leaders were not as able as the non-Malay leaders who possess greater merit. 6. Whenever Government policies such as the NEP were defended, the defenders whether in the Government or NGO’s are labelled racist. The Malay parties in the election pact in Pakatan were tolerated because they were useful for election purposes. 7. If more proof is needed of the role of Chinese racism in the 13th GE, the demonstrations accusing the BN of fraud and cheating in the elections, despite being organised by Anwar and the PKR, are largely attended by Chinese, especially the young. Within the Country and abroad, Chinese youths wearing black shirts and masks made up most of the demonstrators. Usually Malays make up the majority of the demonstrators. The lack of respect for the national flag was shown by Chinese young people in Taiwan holding it upside down. Although DAP and PKR participated in these demos, PAS members were noticeably absent. In fact PAS leaders dissociated themselves from the agitation to overthrow the Government through street demos ala Arab Spring. The protests seem to be mainly a Chinese affair. 8. The indisputable fact is that the DAP has succeeded in destroying the collaboration or sharing between the different races as exemplified by the BN coalition. The Pakatan is not a true coalition. It is simply an election pact between the parties opposed to the BN. This pact clearly benefited the chauvinist Chinese in DAP most, while PAS the most Malay of the Pakatan parties benefited the least, winning only 21 seats against DAP’s 38 and PKR’s 30. Actually although PAS contested in more constituencies than DAP, it lost two seats more than in 2008. 9. 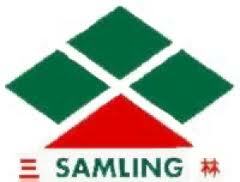 If today the schism between the races is deeper it is because the DAP reject the Malay/Chinese/Indian “kongsi”. The DAP wants the Chinese who already dominate the economy, to dominate Malaysia’s politics as well. 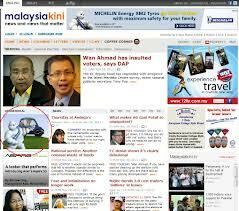 It is clearly racist and reject inter-racial sharing of power and wealth as advocated by the BN. Racial polarization has become more pronounced as a result. It will become more so in the future. KUALA LUMPUR 4 Jun - Satu kajian yang dilakukan seorang penyelidik sebuah universiti awam mengesahkan wujud diskriminasi terhadap graduan Melayu yang memohon pekerjaan di syarikat swasta yang majoriti dimiliki kaum Cina dan asing. Menurut kajian itu, faktor kaum lebih diutamakan berbanding kualiti pendidikan dengan graduan kaum Cina menjadi pilihan untuk dipanggil temu duga berbanding kaum Melayu yang merupakan penduduk teramai di negara ini. Kajian selama enam bulan itu mendapati, syarikat yang dimiliki oleh kaum Cina dan pihak asing lebih mengutamakan graduan kaum Cina untuk bekerja dengan mereka. "Daripada lebih 3,000 resume yang dihantar kepada syarikat terbabit, kaum Melayu hanya mempunyai 4.2 peratus peluang untuk dipanggil menghadiri temu duga. "Kaum Cina pula mempunyai sebanyak 22.1 peratus peluang walaupun mereka mempunyai kelulusan setara dan lepasan universiti sama dengan kaum Melayu," menurut kajian itu. Kajian tersebut hanya melibatkan graduan yang baru menamatkan pengajian daripada institusi pengajian tinggi awam (IPTA) dan swasta (IPTS) tempatan yang memohon bekerja dalam bidang kejuruteraan, perakaunan dan kewangan. Menurut kajian itu, graduan daripada IPTA yang dikenali dan diiktiraf iaitu Universiti Malaya (UM), Universiti Putra Malaysia (UPM), Universiti Sains Malaysia (USM) dan Universiti Kebangsaan Malaysia (UKM) lebih diutamakan majikan. "Sambutan majikan terhadap graduan IPTS adalah rendah dan hanya graduan Universiti Tunku Abdul Rahman (UTAR) termasuk kaum Melayu yang belajar di situ menjadi pilihan terutama dalam bidang perakaunan. "Graduan kaum Melayu yang boleh menulis, bertutur dan membaca dalam bahasa Cina juga lebih berkemungkinan dipanggil menghadiri temu duga berbanding yang tidak mempunyai kebolehan itu," mengikut kajian itu. Kajian itu merumuskan supaya kerajaan memandang serius isu berkenaan bagi memastikan diskriminasi terhadap graduan Melayu tidak berterusan. "Sudah sampai masa kerajaan menerusi Kementerian Sumber Manusia menggubal Akta Peluang Saksama dan menubuhkan sebuah suruhanjaya bagi memantau pelaksanaan akta ini supaya tiada sebarang diskriminasi berlaku di negara ini," menurut kajian itu.